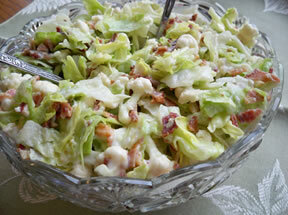 A fresh lettuce salad. The cauliflower adds crunch while the carrots add sweetness. Perfect for Easter or any holiday. You can add some chicken and make it a meal. Bake bacon in oven at 350 until crispy; remove from grease and let cool. 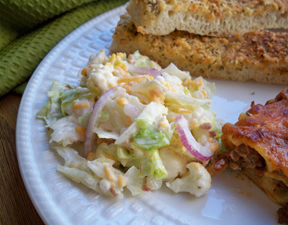 Mix with lettuce, thin sliced onion, cauliflower, and carrots; and then refrigerate. 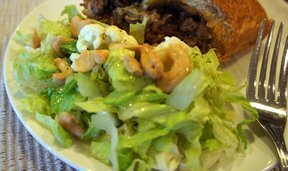 Combine ingredients for dressing. Add dressing and croutons to the lettuce mixture just before serving. So good that there are never leftovers. "I make this every Easter. You can add peas for color and a little shredded cheddar if you like. For a do ahead version, spread the dressing in a layer on top of the salad before covering and refridgerating for a day or overnight. 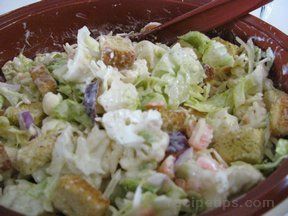 Just stir in the dressing and and croutons (I don't use them as there is enough crunch) before serving!"